Surface sanders, also called drum sanders, have really come a long way. It’s not that long ago that you’d only find surface sanders in large, commercial shops. Today, sanders have become way more prevalent in small shops, and way more accessible to woodworkers. SuperMax has been a name in the surface sander world for a long time. I saw the SuperMax 16-32 at a woodworking show, and couldn’t wait to check it out up close. I finally got that chance. Here’s your look at the machine. 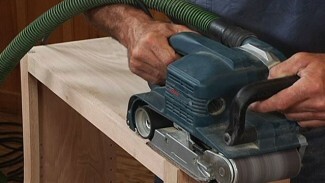 In general, I like having a surface sander because it speeds up my woodworking, and does a great job on dust collection. It’s lots faster to feed project parts through a sander than it is to run a random orbit sander over every piece. To be fair you’ll still have to do some random orbit work, but very little is required following a surface sander. And, with a good dust collector, you’ll see very little airborne wood dust. Quick advance on height changes. No need to spin the handwheel a million times. Just use the quick move lever when you’re going from thin to thick to thin. Folding infeed and outfeed tables. Don’t need ‘em? Fold them out of the way. IntelliSand. The machine automatically reduces the feed rate on the conveyor if you’re trying to take off too much material per pass. Easy to sand wide parts. This machine handles material up to 32” wide. It’s very easy to do a reset on the sanding head to allow this. Want to know more about SuperMax Tools and the 16-32? 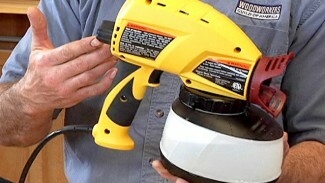 Visit supermaxtools.com, or call (888) 454-3401. Sanding is a necessary part of woodworking. And there’s more to it than just rubbing sandpaper back and forth on your projects. 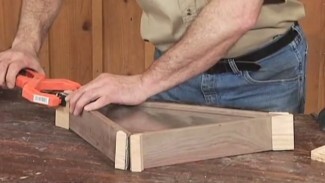 Learn more by watching more videos on sanding. Good video but severely lacking in key information. What are the advantages of a drum sander? Why would a home shop need one? They seem to be an expensive luxury. Also, this video failed to discuss my biggest concern: how hard is it to change the sanding drum. This question has multiple aspects: how long does a typical sanding drum last, and how expensive are the drums? During regular sanding, one often works from coarse to fine grit. Changing a sanding pad on a ROS is easy. It would seem like on a machine like this it would be much harder on a given job to work down to finer grits. A follow up video addressing these questions would be crucial to decide whether to spend the money or not. What are the advantages of a drum sander? (WWGOA) The biggest benefits are: performance, precision, consistency. Additionally it’s possible to sand many materials that you can’t plane, such as man-made products, end grain cutting boards, non-ferrous metals… You can also flatten large slabs, like table tops, much more easily than you could with a belt sander or random orbit sander. Why would a home shop need one? (WWGOA) I wouldn’t say “need” is the right word here. They provide a great boost in efficiency, so you can build more stuff in the same amount of time. It’s wonderful to have your project pieces sanded to a near-completion point prior to assembly, saving lots of time spent with an ROS later. But a hobbyist can get by without one. Also, this video failed to discuss my biggest concern: how hard is it to change the sanding drum. This question has multiple aspects: how long does a typical sanding drum last, and how expensive are the drums? (WWGOA) By sanding drum I assume you mean the abrasive. The abrasive wraps on the drum in a spiral. It takes less than five minutes to change paper. Prices vary on abrasive, depending on how you buy it. You can purchase rolls that are already cut to size for a particular machine, or you can buy long rolls of paper and cut it yourself, which is more economical. Price per application will depend on what machine you have. As far as the aluminum drum itself, I can imagine what would precipitate changing one. During regular sanding, one often works from coarse to fine grit. Changing a sanding pad on a ROS is easy. It would seem like on a machine like this it would be much harder on a given job to work down to finer grits. A follow up video addressing these questions would be crucial to decide whether to spend the money or not. I would think any review of this type of machine would have to include the changing of the sanding grit, no? Ticket 16963 George, great video! Do you think the new features on the 16-32 outweigh the additional capacity of the 19-38? The new features of the 16-32 are great, but whether they outweigh the additional capacity of the 19-38 will depend on the projects you do in you your shop. If you lean toward larger projects, you’ll need the width capacity the larger machine offers. That being said, I love having digital read out on ANY machine I’m using. George agree 100%, if only Super Max had an oscillating version like Jet does that I absolutely love. The oscillating feature extends the sanding belt life considerably, sands much better and minimizes burning especially in woods like cherry.